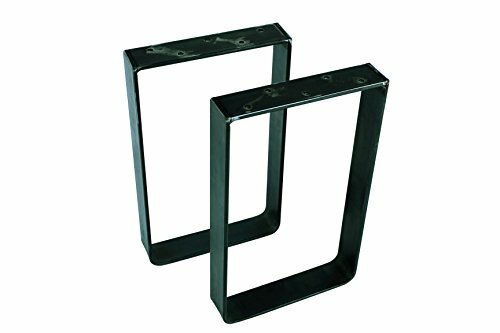 Thank you for looking at DiyMetalLegs products. Our square or trapezoid legs have simple lines that will be a great addition to your DIY projects like tables and benches basically anything your imagination has created. Square or trapezoid legs can be made with 2" or 3" wide flat bar, it is ¼ "thick. Typically, 2" wide flat bar legs are best for smaller size squares. 3" should be used for larger squares. If you need legs for a long bench you might want to consider going with three legs. This will help with stability. We will also weld an X in the center to help with strength and stability. If you are unsure what to use for your project, feel free to contact us and we can give you information that might make your purchase decision easier. If you order Unfinished Raw Steel legs you need to consider how you are going to care for your legs. Raw steel will rust. There are several solutions that you can consider. If you want them to remain in the natural state, you can rub beeswax or furniture polish (nothing acidic i.e. lemon as this enhances rusting) on them or powder coat them clear. You can also paint them with a rust resistant product. Our shop offers powder coating the colors are Clear, Matte Black, Satin Black, Glossy Black, Matte Brown, Glossy Brown, Glossy Yellow, Glossy White, Glossy Red, Satin Gold, Textured Rust, Brushed Steel Clear Coated and Glossy Chrome. Shipping: Free Flat Rate Shipping for Continental U.S. states only. Shipping to Hawaii and Alaska it is additional. Please contact us for these rates. Please do not hesitate to contact us if you have any questions, we can build any size legs that your project requires. We also do custom work so if you have an idea send it to us and we will try to bring your vision to life. Our shop is in Rogers Arkansas, USA. FREE SHIPPING: Orders ship within 2 days of order. Square or trapezoid legs can be made with 2" or 3" wide flat bar, it is ¼ "thick. CUSTOM WORK: Please do not hesitate to contact us if you have any questions or if we can do anything to make your purchase decision easier. We can build any size legs that your project requires. We also do custom work so if you have an idea send it to us and we will try to bring your vision to life. If you have any questions about this product by Diymetallegs.com, contact us by completing and submitting the form below. If you are looking for a specif part number, please include it with your message. 5/8" Dia. Felt Nail-on Slider Glide Pads for Chairs, Stools, & Tables - Furniture Slides Like Magic -Tile & Hard Wood Floor Protector - Espresso - 100 pcs.